Smartphone Nation AT&T Rumored to Lose iPhone Exclusivity this Wednesday? AT&T Rumored to Lose iPhone Exclusivity this Wednesday? 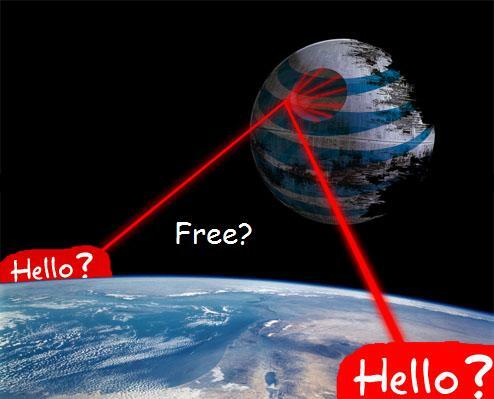 We’ve all heard this phrase before, “I want it but I don’t want ATT”. The speculations and rumors are heating up about the latest iPhone news and Apple breaking their ties from ATT. Now while it is not a 100% guarantee that will happen is unknown. One of Hot Hardware’s inside sources feels very confident that AT&T will lose its iPhone exclusivity during Apple’s big announcement this week. The announcement should be made following the introduction of the iSlate/iTablet/iPad and iPhone 4.0. Now if this comes to be true, sales for Apple will sky rocket. Look what not having exclusivity in Europe has done to the profits they’ve made, A LOT. The question(s) that will be asked if that does happen is where will the iPhone go next? Will Apple sell the iPhone unlocked in their stores? Who will puchase one if it is unlocked? What about Big Red, can they handle the exsessive amounts of data the iPhone clogs uses if they get it? Only time will tell. One thing is for sure though, if ATT does lose exclusivity, who will walk into their stores now?